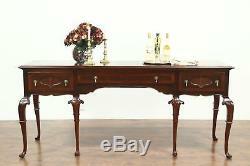 Carved Antique Banded Walnut Sideboard, Server or Buffet, Signed Tobey #28823. An elegant sideboard, server or buffet from the 1920's was carved of walnut and signed by luxury maker, Tobey of Chicago and New York. The original finish is in excellent condition on this American made antique furniture, the hand rubbed top is silken to the touch. There are small shrinkage separations from age and minor mars, see photos. Matched walnut is surrounded by intricate rosewood banding and burl panels. Drawers have solid oak dovetailed sides and original hardware. Measurements are 7' long, 23" deep and 37" tall. Please view 25 photos at full screen size for best detail. The Harp Gallery 2495 Northern Rd Appleton, WI 54914. We are only happy with satisfied customers! Please reach out to us with any concerns or questions. The item "Carved Antique Banded Walnut Sideboard, Server or Buffet, Signed Tobey #28823" is in sale since Thursday, May 24, 2018. This item is in the category "Antiques\Furniture\Sideboards & Buffets\1900-1950". The seller is "harpgallery" and is located in Appleton, Wisconsin. This item can be shipped to United States.